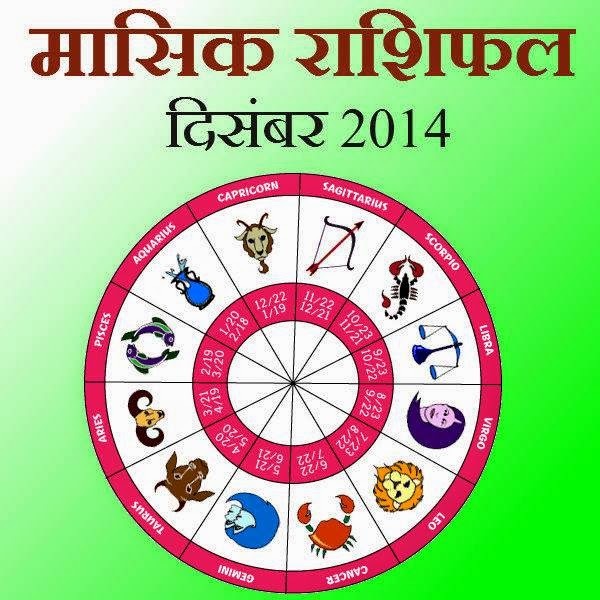 Check out the December 2014 month Horoscope (December 2014 rashifal) for all zodiac sign. This is December month's monthly prediction for all zodiac sign. Aries: In general this month is positive for you. Your sign lord is exhausted in karma house i.e. 10th house. Positive effects are obvious during this time. If you will get success you will get profit. With profit you will get happiness. But in comparison to first half of the month second part will be even better. Because Sun and Venus are in 8th house during the first part of the year which are not giving proper effect in personal life and matters related to respect and honor. They will come in destiny house i.e. 9th house in the second part of the year which will naturally bring you bless. To avoid any hurdle during this month offer water to lord Sun. Taurus: Stay very cautious during this month because whatever you are doing this time is not giving you proper results. Keep patience and don’t worry at all. I cannot take guarantee of other people but I can say your 7th lord Mars is exhausted. It means that if you are married your spouse goes really awesome time and his/her luck will get you benefits. You need to control over your eating habits too. Otherwise digestion might pills come in use. Take care of yourself because everything is going to be fine in the next month. In times of trouble offer vermilion mix of water to the lord Sun and everything will be fine. Gemini: This month will give you mixed results. If on one side things are on your favor. On the other hand success rate might stay a little weak. Though, due to exhaustion of 11th lord in 8th house, you might get sudden money from somewhere. Your self-confidence will be high. No tough situation will be found. There are chances of promotion too. But in the second half of the month you will have to take care of your family along with work as well as your own health. It will be auspicious to reside Bajrang Bann. Cancer: All most entire month will be auspicious for you. There are very good chances of success in all your endeavors. You will welcome like full of during time. There are chances of getting greed of the troubles relating to progeny or love partner. You will get even better in the second half of the month. Nor only in business matters but also you will see betterment in job. And there are chances of promotions too. Name and fame will also increase. It will be auspicious to donate oranges in lord Vishnu’s temple. Leo: You will have to work harder to get better results this month. You will to take special care of your family members. It is important for you to notice of the environment of your home is harmonious or not. Also you will have to keep yourself stress free. Internally keep yourself strong because it is our mind that gives us strength bit physical or mental. You will feel stress about expensive gifts for children or your love partner. Offer chola to lord Hanuman during trouble. Virgo: This month is going to mixed results. You may have to do a lot of hard work in the first part of the month. This hard work fetch you good results. Time will also be beneficial in financial matters. But you will have to stay at bay form unnecessary expenditure. Second half of the month might give you some stress. It will be good to take support of entertainment to stay stress free. Your energy might decline during this time. Try to take all your decisions in each matter very carefully. Offer food to little girls to avoid troubles. Libra: Starting of the month coming with some expenditure. So you will have to do everything very carefully. Your phones health stake at this time. Take special care of it. You need to keep eye on your phone because it might also get lost or stolen. Some familiar matters also might get troubles. However the second part of the month will vanish all your troubles. Benefits also seem through journey. Donate red fruits or vegetables in lord Hanuman temple and everything will be fine. Scorpio: In general you will keep on getting positive results this month. You will be full of self-confidence this time. Friends and brother will be helpful. But you will have to keep a control over your temper. Otherwise, some of your sweethearts might get hurt and such a situation. Your internal strength might get hamper. So avoid being short temper. Even in the second half of the month you will have to keep caution in the familiar matters. Your financial matters will also seek your attention. Also you need to keep an active eye on over your health. Offer honey to Shivaling and stay blessed. Sagittarius: Starting of the month is not very positive for you. Expenditures may take a toll over you during this time. But those who are putting efforts for going abroad will get success. Journeys made in other matters might not be successful. Don’t do anything being crazy during this time. Avoid traffic in journeys as much as possible. Keep your actions very controls in business. Stay bay from unnecessarily expenditure. Your troubles will vain away to quite good extent in the second half of the month. But it will be very important during this time proper caution. Chant Gayatri mantra 11 times every day and everything will be good. Capricorn: This time is quite positive for during things related to home. But you might get short temper at times which you need to control. Do not show your anger toward family members. Overall your energy will be high. All your work will be accomplished but if you are married avoid any arguments with your spouse. Watch good film with your loved ones. You may get into profitable deals during this time but the second half of the month might be full of expenditure. It will be important to take care of your health too during this time. Feed green grass to the cow and everything will be fine. Aquarius: Month of December is positive for you. Especially work is related to abroad or far from the place of birth. You are going to get good results. You will do great at work at first part of the month. Chances of business trip are forming. You will get support of the seniors they will be happy with you. Your financial situation will also get better. In the second half of the month beneficial situation get even stronger. You will spend a good time with your love partner. Donate black grams to a need person and everything will be fine. Pisces: Your financial situation will get better this month. Profit rate will increase and you will get successful in accumulating good money. You can go for distant journeys during this time and can also get benefits through them. You might meet people seating at higher authorities and might find opportunities to benefit through them. If you have any trouble related to education or children everything will be fine during this time. But it will be important to take care of your father’s health. Second half of the month will be very good for work. Financial situation will stay strong. Offer your service to your father or someone like him and things will turn in your favor.